Hot on the heals of the second generation Porsche 911 Carrera, Zuffenhausen has unveiled the new Porsche 991.2 Turbo and Turbo S ahead of the models’ debut at the Detroit Motor Show on 11-24 January 2016. Available immediately in both Coupe and Convertible guises, the new Porsche 911 Turbo and Turbo S feature a number of styling cues taken from the updated 991.2 Carrera, such as the 3D effect rear lights and revised door handles. The Turbo and Turbo S also get new front and rear bumpers with larger air intakes and exit vents on the respective fascia, while the decklid has also been modified with a central induction intake now flanked by two rows with longitudinal louvres. New Porsche 991.2 Turbo S comes with PASM and PDCC active roll control as standard. The wheel options (now measuring 9×20-inch and 11.5×20-inch front and rear on both models) have also been given a refresh; the Turbo S’s centre-lock items now feature seven, rather than ten, double spokes. Of course, like any Porsche 911, the second generation 991 Turbo range is all about the engine. Like the Gen1 cars, the 3.8-litre twin turbocharged 9A1 flat six returns on the Turbo and Turbo S with a modest power boost for both iterations. Thanks to modified inlet ports, new injection nozzles and a higher fuel pressure, the new Porsche 911 Turbo now generates 540hp while the larger compressors of the Turbo S help it to achieve an output of 580hp. Interior layout and design is carried over from the latest Carrera models, although Turbo and Turbo S get Sport Chrono package and GT Sport steering wheel as standard. Here at Total 911, we can’t help but feel that, given the minor aesthetic revisions, Porsche has missed a trick by failing to give the 991.2 Turbo S a headline-making 600hp (especially with TechArt squeezing a similar figure out of the Gen1 Turbo S not long after the car’s launch in 2013). Despite this, the Porsche 911 Turbo S can now officially sprint from 0-62mph in 2.9 seconds (a 0.2 second improvement over the outgoing model) while the Turbo and Turbo S can now top out at 199mph and 205mph respectively. The forced induction 9A1 engine now also comes with a dynamic boost function to improve throttle response. By solely interrupting the fuel injection during load changes – such as lifting off the throttle – the engine can now respond with practically no delay, an effect accentuated in Sport and Sport Plus modes. At 540hp, the new Porsche 991.2 Turbo is only 90hp more powerful than the latest Porsche 911 Carrera. Is it enough to justify a £6,000 price hike? Inside, the cabin is taken from the 991.2 Carrera, with Sport Chrono standard on both Turbo and Turbo S. This brings the 360mm GT Sport steering wheel with it, combined with the new Mode Switch (derived from the rotary dial in the 918 Spyder), while the revised PCM system is also integrated into the centre console. Like the Carreras, the new Porsche 911 Turbo and Turbo S now come with a PSM Sport mode and a lift kit, providing an extra 40mm of ride height at the front, is available as an option. Prices for the Porsche 991.2 Turbo start at £126,925 while the Turbo S’s list price is £145,773. Despite the 200mph-plus autobahn bragging rights of the latter, the £3,653-£6,327 price hike doesn’t seem justified right now but, as ever, we will reserve outright judgement until we get behind the wheel. 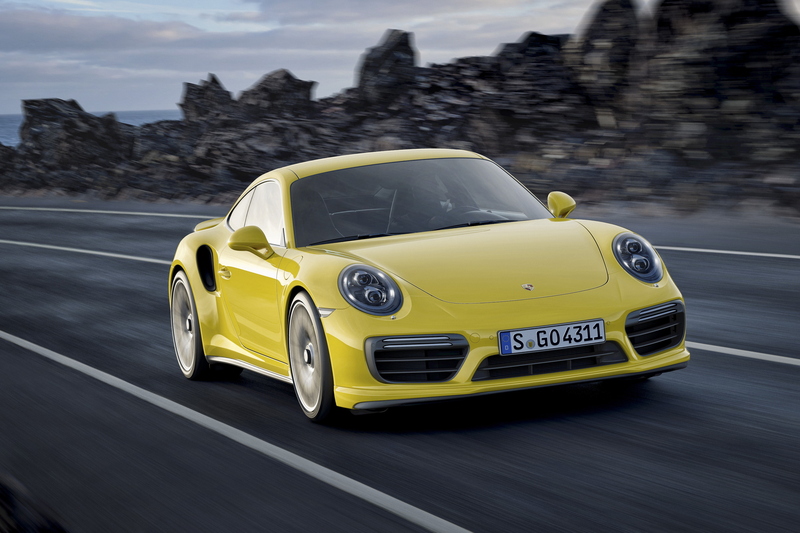 What do you make of the new Porsche 991.2 Turbo and Turbo S? Join the debate in the comments below or head to our Facebook and Twitter pages now. Cabriolet versions are also available for immediate order. First deliveries are expected to UK Porsche Centres at the end of January.